It was a terribly hot day as my taxi winded its way down the road alongside ShivSena Bhavan and I was wondering about some questions that popped into my mind after seeing a large poster of the erstwhile Shiv Sena Supremo. My thoughts quickly returned to the sweltering heat and eventually to the cabbie who now demanded change. No sooner had I gotten off the taxi than I saw some people who already had a seat comfortably at one of the many tables in CCD. I didn’t know these were my fellow atheists, so I stood outside waiting to see a familiar face. Out of the blue a smile greeted me and an outstretched hand reached for mine; he asked me if I was there for the Freethinkers’ meeting. After I replied in the positive, he introduced himself as Mustan, a new member to the group but an old friend of Atheism. Listening to his experiences in Religious schools and after a couple of calls to Yash Gadhiya and Yazeed Qureshi confirming their arrival we finally made our way inside where we found Swati Naik, Dawson and Sudendhu waiting for us. We soon pulled a couple of tables together thanking the “Gods” that it wasn’t a no show as we had 6 people already. 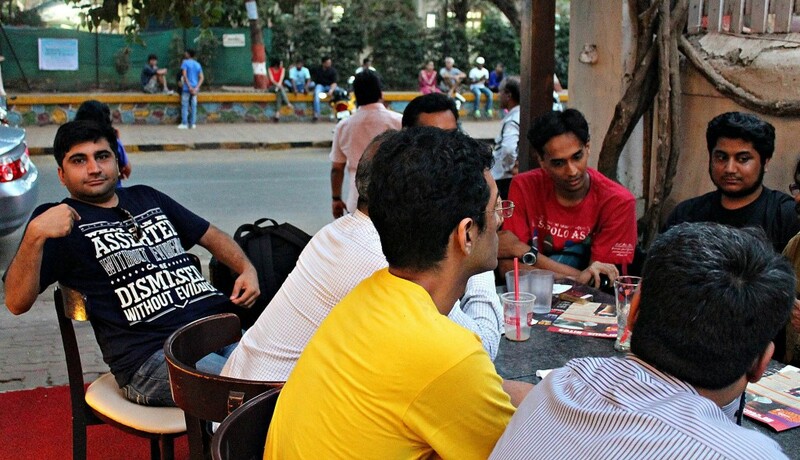 We were pleasantly surprised as more and more people started joining in including Danesh , “JIM”, Rupesh, Rohit, Toshan, Subeer and Anuj, It was a big turnout! The idea of a Saturday meet was successful in the first go. (Although it remains to be seen if the result is reproducible). Two more guests were Balu and Jennifer – Balu is a member of the Chennai Freethinkers and Jennifer is a journalist based in the United States. Her primary question was how does India, which is mostly religious, deal with Atheists in its fold, or rather, what is the position of Atheists in India? What followed was a quick take on the Atheist Parenting question, what should children of Atheist parents learn when they grow up? Should they be exposed to the religious order or should they be kept away from indoctrination? Almost everybody had a different opinion on this and was nicely debated. Several members of the group admitted that they would present their children with all the information they could possibly give a child at some stage, while some contested that if they knew it was indoctrination, why would you expose your kids to the same venom that you have just spent a few years escaping? The answer was finally agreed upon as, let the children decide what they want to do. Yash recounted that his 1 year old daughter, would be taught by her grandmother to say ”Jai Jai” with folded hands whenever she came across an image of a ‘god’ and Yash would suggest to give the god a “YO!” sign instead! By this point the CCD employees were getting visibly frustrated because up till now we had had only water and nothing else to fill their cash registers. A quick glance through the menu and some picking and choosing of cold coffees and coolers, off the man went with a smile on his face. Also by now, the smokers got restless and moved towards the end of the table so they could have a quick smoke and return to their seats. The next agenda was to discuss how religious fundamentalism of one religion affects religious fundamentalism of another. We discussed the assassination of Gandhiji, the reaction of the fundamentalists to the speech by Akbar Owaisi at a rally in Hyderabad, how the Mumbai violence brought our city to a standstill some months back and the country-wide repercussions of the violence. Also on the table were talks of Dr. B.R Ambedkar and his discourse on accepting Buddhism to counter the caste system of the Hindu society. Sudhendhu argued that perhaps Dr.B.R Ambedkar was a closet Atheist and if he was, he ought to have come out as one and asked the people to come out as Atheists as well. By this time no one was at their original seating. We were moving about, bonding and actively engaging in discussions that mattered a lot to us. 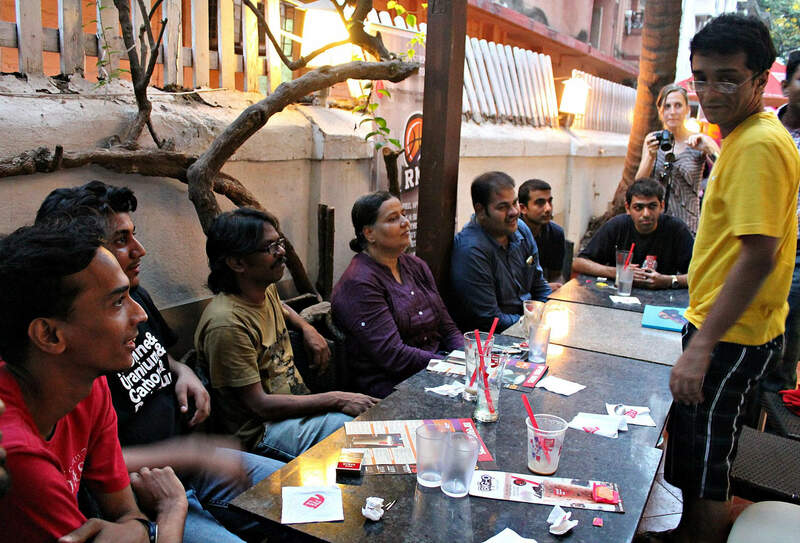 Cutting into the discussion was Balu, our friend from Chennai Freethinkers, who made some excellent suggestions. We should not end up preaching to the choir. We should gain a reach into the society through some social activities. It was already 8:00 P.M and we all thought that it was an evening well spent. I couldn’t possibly write down all the topics we discussed but there were fantastic contributions from every single member who was at the table. The ones I have missed could be written down in the comments section so that the other group members can be brought up to speed on the events. Everyone from the group wanted to stay on longer, alas time was our enemy. It was obvious from this particular meet that we are growing bigger, Ladies and Gentlemen and it’s time to step up. The last thing Yash and I discussed while walking down to the station was that we better move the next meet into a place with an air conditioner. The next meet is tentatively scheduled for 26th of May. So join us and experience the joys of a Freethinkers’ Meet! Congrats young freethinkers, go ahead. Mumbai Freethinkers, we need to address the issue raised by observer Bala S. from Chennai about weeding out racist and anti-feminist members from the group. The Psychology of Oppression. An Attempt to Understand the Oppressor's Mind.